It's a strange thing that Glendullan is relatively unknown as a single malt whisky; measured in production capacity (almost 4 million litres of alcohol per year in 2008) it's actually Diageo's second-largest distillery, right after Dufftown and before Caol Ila that has the number 3 spot. Glendullan distillery is located in what's probably the busiest 'whisky town' in the Speyside area: Dufftown. It was built there (relatively late) in 1897-1898 by William Williams & Sons Ltd., blenders from Aberdeen. In 1919 William Williams & Sons Ltd. changed their name to Macdonald, Greenlees & Williams (Distillers) Ltd. In 1926 they were taken over by the DCL, which later evolved into whisky industry giant Diageo. 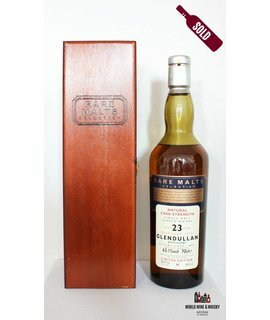 In 1939 Glendullan was transferred to SMD, another predecessor of Diageo. The old Glendullan distillery was completely refurbished in 1962, at which point two brand new stills were constructed. However, in 1972 a new distillery was built next to the old one. The new Glendullan distillery had six stills (three times as many as the old one) and both operated side by side until 1985, when the old distillery was finally closed. The whiskies produced at these two distilleries were different from each other, but nevertheless they were simply vatted together before bottling or blending. That's particularly funny because Diageo (together with Glenfiddich) claims to have educated the world about single malts a few years later and kept pointing out how every pot still was unique and irreplacable.